Are you someone that doesn’t take life too seriously? Are you a bit of a joker and an all round funny person? Perhaps you’re the life and soul of the party and you want to inject that fun loving feeling into your wedding? Well, you certainly can with this special wedding invitation! The Guess Who design from Blush Stationery is one that will enthral your guests from the very moment they open the envelope! 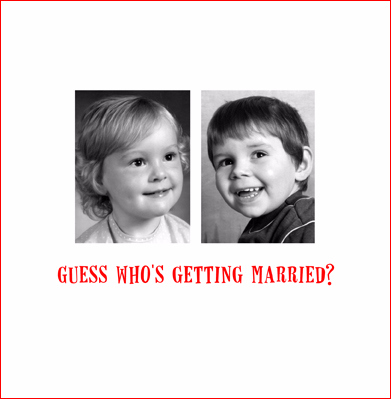 Unless they know you pretty well they may just be left wondering who on earth it is getting married, until of course, they turn their invitation over to reveal the identity of the couple in question! Bold, simple and lighthearted, you can’t go wrong with this little number! Reminiscent of the all time favourite childhood game, ‘Guess Who’, you can have your own bit of fun and be as obscure or obvious as you like! Whether you choose to use a picture of your other half watering his Grandma’s plants with his little tinkle when he was three or one of him in his Scouts uniform, your guests will certainly get a glimpse into times gone by. Tie this invitation into your wedding venue by dedicating a wall to your family photographs; showcase your childhood, teenage years and adulthood right up until the day you met and finally got engaged. If you’re organised enough to have a polaroid camera you could even finish the story off on your wedding day by adding a picture of you both at the alter!